Price: A subscription for Britannica Pathways: Science is determined by number and nature of access. Contact sales for specifics. Pathways: Science is an online, interactive approach to teaching the scientific method in grades 6, 7, and 8 with a framework that is ideal for project-based learning, teacher-led instruction, and STEM programs. Created with the goal of targeting common scientific misconceptions, Britannica’s Pathways: Science is a lesson package for teaching life, physical, earth, and space science to middle school students. Rather than just present scientific facts like a basic encyclopedia, Pathways guides students through the scientific method, leading them through a method of inquiry from essential question, through hypothesis, to information gathering, and finally to an evidence-based conclusion, which enables students to learn as they conduct research. Students are shown how to reach conclusions by comparing and contrasting information, determining central ideas, evaluating arguments, and analyzing evidence. The student and the teacher can then view or print the completed lesson responses and notes. Pathways: Science has interactive exercises that connect to Britannica’s quality online resources, with articles, illustrations and videos that engage students and help them understand scientific concepts. There are ten modules with a hundred lessons on the topics of living systems, genetics and evolution, the environment, matter, force and energy, light and sound, earth systems, the universe, and the nature of science. Since this is a web-based program, installation is a matter of buying the service and ensuring all computers are equipped with proper supporting programs, internet connections, and settings. It also makes the product accessible from a wide range of Internet-capable devices, and allows for updates and reviews of the included materials. There is free online training and other support materials, plus technical support is available as needed by phone or online contact. Pathways: Science can be accessed with equal effectiveness on a PC, laptop, or tablet device from any Internet-accessible device. As teachers and students begin to learn with Pathways: Science, intuitive navigation instructions and lots of support materials make this an easy program to use. There is a teacher dashboard, which outlines various Sample Implementation Models, to help guide instruction, explains the teaching philosophy that is supported, and indexes lessons by state standard. This way, teachers can quickly and easily find lesson plans that can be easily modified to fit student ability and timeframes, and which support certain standards. These resources are also available and printable through a Teacher Notes link in the “Investigate” portion of a lesson, along with a detailed description of the resources presented. If students need to work offline, there are printable lesson worksheets to guide them through the lesson and allow them to record their work. "Lesson Worksheets," on which students may record their notes and the evidence they gather when reviewing the "Investigate" resources, and all of the resource images, articles and a brief video caption for each video in the “Investigate” section are also printable. There are no fancy bells and whistles, but there is everything that would be needed to learn science concepts through nvestigation.. Pathways makes it as easy as possible to use: there’s no limit on the number of simultaneous users, and Britannica Pathways: Science is fully compatible with technologies such as interactive whiteboards and virtual learning platforms, and works equally well on PCs or Macs, on iPads or other Internet-compatible devices. This makes the homework and preparation for flipped lessons so much easier, and allows teachers to more easily plan for whole group, small group and individual learning. Schools simply need to be sure that adequate access is provided for all students. All elements work together smoothly, and allow students to read or examine resources, easily take notes or copy and paste sections of articles into a “notepad” on the same screen with the help of a spell-checker, and respond to guiding questions. These notes are carried along throughout the lesson, and provide the student with support for their answers to questions at the end of the investigation, thus helping them form a conclusion. Fonts are easily enlarged, and the articles can be heard aloud as the sentences are highlighted, which helps readers who may have difficulties access the same information as the rest of the class. It might make student access easier if teachers could assign usernames and passwords, which are automatically generated; passwords consist of random letters, which may be difficult to remember, but a list of students and their log in information is printable. Schools also need to consider whether adequate access to computers is available. A wide variety of resources is presented, allowing student choice of format and addressing many different learning styles, which are easily identified by color. In the menu of sources, reference articles are green, videos are purple, and annotated images and diagrams are orange. The modules engage students through inquiry-based learning, helping them to practice forming hypotheses and testing their ideas, evaluating data and reaching informed conclusions. Teachers can track student progress, and allow a student to restart a lesson. The material and research method support the Common Core Standards, foster reading in the content areas, and encourage students to drive their own learning. Since Pathways: Science can be used at home for flipped lessons or homework or just for investigation, it strengthens the home-school connection, and allows students to guide their own learning. 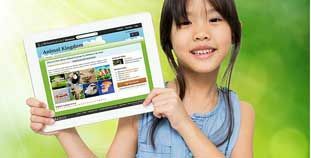 With nearly 100 lessons tied to the Common Core and science curriculums, Pathways: Science uses a consistent predict-investigate-conclude process that teaches inquiry-based learning, critical thinking, and conceptual change, while presenting a wide variety of quality resources from Britannica Online School Edition. A simple teacher dashboard makes it easy to manage classes, track student progress, search for lessons by standards and implement effective inquiry-based lessons. Since it is web-based, and equally effective on any Internet-ready device, Pathways: Science can be accessed from school, home, or anywhere that the Internet is available, making it ideal for BYOD programs and flipped learning situations.